CRAZY DISCOUNT! Was: $59.95 Now: $29.98! Does Your Pet Have Difficulty Climbing Up To His Favorite Spot? The solution is this convenient dog steps! 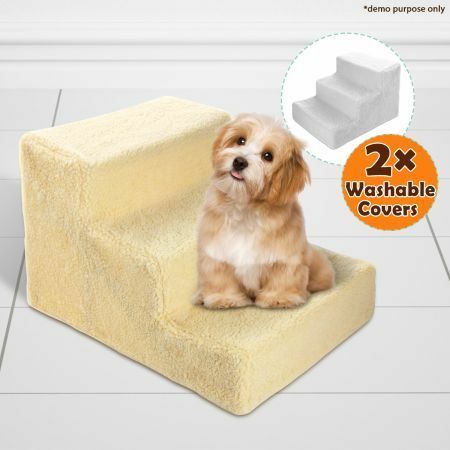 It's just the right height to help smaller and older dogs step up to where they want to go - up to couches, beds and more! It's also great for pets to step up into cars or trucks. It's lightweight and portable so it goes anywhere - indoors and out! No more bending over to help your pet up, so there's less stress on your back too! These dog steps are essential for pets with hip dysplasia, arthritis or simply old age. It gives your pet freedom from the floor - and more companionship than ever before! Comes with a plush sheepskin-like washable cover for indoor use. *Note : Images shown are for demo purposes only. Actual item may vary in colour from images shown. This product comes with a 90 Days Warranty, please click here for details.